Ready to transform your landscape? Let us work with you to build an oasis you can truly enjoy. Design services are FREE! 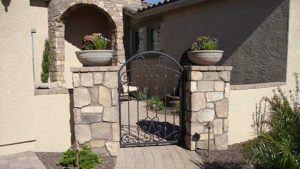 Welcome to Arizona Living Landscape & Design. 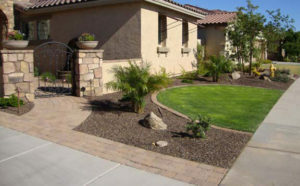 We are a full service Arizona Landscape Company. 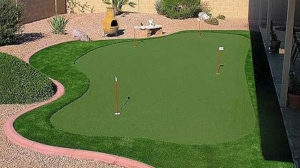 Our services include: FREE Custom Landscape Design – Synthetic Lawns or Artificial Golf Greens – Paver Patio – Fire Pits – Concrete – Fireplaces –Flagstone –Sod Installation –Sprinkler systems and repairs -Curbing Border –Misting Systems –Yard Revamp –Built-in BBQ, Pergola –Desert Landscape Installation –Tropical Landscape Installation and so much more. Isn’t it about time to get rid of that dirt and have the backyard oasis you’ve always dreamed of? 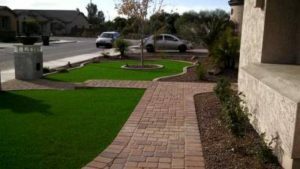 Az Living Landscape will take your vision and create a custom landscape design for the back yard landscape of your dreams. What about curb appeal? Are you wanting to freshen up your front yard landscape and give it a new look to stand out in the crowd? Then let us help you bring your ideas to life. The sky is the limit. Just imagine what we can build together. We can custom landscape design anything you can imagine for your creative environment. 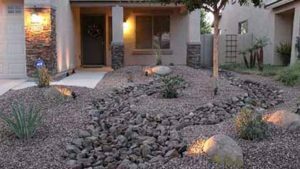 Call Arizona Living Landscape & Design today for a FREE estimate on your Arizona landscape design and installation. 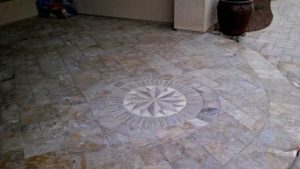 We are Arizona’s Best Landscape Company and the company to call for quality service, creative designs, and amazing customer service all at an affordable price. From start to finish they did an amazing job. Pete, the business owner spent alot of time with us planning and designing our project to make sure we would be satisfied. He started and completed the job on time. Pete and his staff were extremely polite and professional. He promptly responded to any question we had making for a pleasant experience. Our entire landscape came out beautiful. I would highly recommend this business. Thank you for fitting us in before Christmas to get our driveway and courtyard paved. We are so appreciative of this and it looks simply OUTSTANDING!!!!! We are so pleased with the results and many of our friends and relatives were able to utilize the functionality of the pavers. Your personnel is simply fabulous to work with! Thanks again and I can’t wait until we do the barbeque this year!!!!! Completely transformed our front and back yard. We were very impressed with the professionalism of the workers. The very large pergola they put up is amazing. I would recommend them for any landscaping needs. 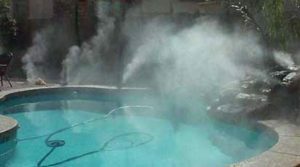 We have used Arizona Living & Landscape for around six years. They are truly professional and very easy to work with. Tami and Pete have always made sure we are satisfied with the job they are doing and always welcome feedback on anything they could possibly do better. It is a relief to know that they take good care of our yard and it will look perfect when we get back to enjoy the great Arizona weather! Thanks again Tami and Pete and all your great crew. We just had our backyard updated by Pete and his crew. 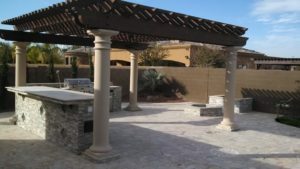 They did a great job melding the existing and new elements included a beautiful pergola and pavers to complete the yard. It is truly lovely and just what we envisioned. We made a number of changes during the design process and Pete was always prompt and receptive to making the changes and adding suggestions to improve our vision. The installation was done perfectly and all our questions and concerns were addressed and resolved immediately. Working with Pete, Adam and Tami was a true pleasure. We love our “new” yard. 5 stars for sure. THANK YOU!!!!! Job well done!! Already neighbors are coming over and asking who our landscape contractor was. THANK YOU!!!!! Job well done!! Already neighbors are coming over and asking who our landscape contractor was. I want you to know from my first meeting with Pete and the first contact I had with Tami sending me a typewritten clean copy of the contract that this experience with Arizona Living Landscape & Design has been a 10 out of 10. Because of the experience I had with your company and the crew I feel obligated to post this testimonial. 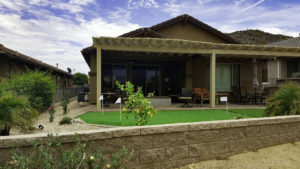 My recent experience with Arizona Living Landscape & Design rates a score of 10 out of 10. I met with owner Pete to give him a rough design of what we were looking for in both our back and front yard. Pete was very patient with us and submitted several ideas for the complete job, calling it work in progress not the final result. Pete prepared a contract at our first meeting fine tuning it to include PVC for the sprinkler system vs, poly and customizing rock/granite and plants/trees to help this project fit into our budget. Pete's wife / admin immediately took Pete's rough draft contract and emailed me a typed final version to eliminate any confusion. Tami was very helpful in helping us pick plants/trees as this was not our expertise, including locations. THE CREW, Adam and Ryan kept us in the loop every step of the way to insure we would be happy with the final product. The rest of the CREW was very respectful and courteous. Even if the landscape was to the owner Pete's design Adam & Ryan would ask once laid out if that was what we anticipated. Stating that "sometimes things look different on paper then the actual finished product". That gave us a chance to move things around, which we did before pavers were cemented in, bushes/trees were planted and artificial turf was laid. The back & front yards are truly a paradise and turned out even better than we anticipated. We interviewed 8 landscape companies and can save others from going through this process by going directly to Arizona Living Landscape and Design!! They cut to the chase and do exactly what is requested and exceed expected. Project was completed a day early and clean up was pristine leaving the street and sidewalk cleaner than when they started. We are so happy with it. We can’t thank you enough for all of your exceptional work! We'd like to thank all of you at Arizona Living Landscape and Design! Especially to Pete, Adam and the crew for making our dream patio and backyard come true! We also decided to upgrade our front entryway which really improved the curbside appeal of our home! We are so happy with it. We can't thank you enough for all of your exceptional work! With Pete's knowledge of the business, his personal touches, and the great pride he and his crew take in the quality of their work, we now have a beautiful backyard and patio and entryway which exceeded even our expectations! It was also such a pleasure to work with Pete! He's extremely knowledgeable and his willingness to answer and explain all of our questions at every stage of the landscape design really put us at ease. 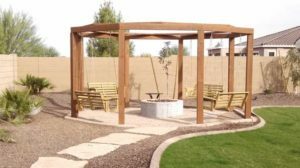 His attention to detail and his many landscaping ideas were imperative in helping us figure out what we wanted and needed for our backyard design -- all with staying within our budget! And the end result is an absolutely amazing, strikingly beautiful space which we will enjoy for years to come! You guys are awesome! Pete's expertise, honesty, incredible customer service and high quality work, are reasons we'd recommend Pete and his crew to anyone thinking about adding any kind of landscaping to their home. 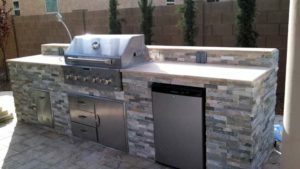 Arizona Living Landscape and Design is a company that goes "Above and Beyond"! We love everything you've done for us and I know we'll be using your services again! Pete and his crew did an outstanding job revamping my large back yard. Everything existing was removed: flagstone patio, plants, drip lines, pink granite. Then they added 25 tons of dirt for mounding throughout the yard, new boulders, paver patio, synthetic turf, trees, pigmy palms and plants, all new drip lines. 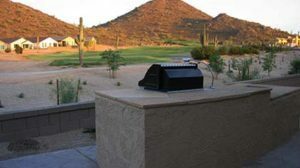 26 tons of new brown granite and built a beautiful outdoor kitchen. As Pete said adding my new gas line was a complicated endeavor, but was accomplished with nothing damaged. Very little rock or dirt in my pool. My yard looks great, and we are so please he is working on plans to redo the front. Pete has great ideas, listened to what we wanted and even was able to save some costs on the gas line. I will use again.